It's the end of February, and those of us in Melbourne, Australia, are flitting between hot, sweltering stretches and cool, wet episodes. You might say it almost feels tropical. So let's talk about kaffir limes today. You may be more familiar with kaffir lime leaves, which was featured in this blog last year (see my chilli kaffir tamarind tofu recipe here). 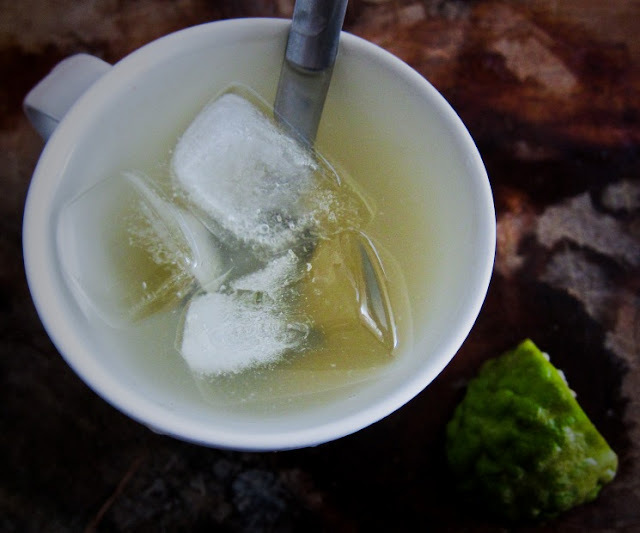 The kaffir lime fruit, however, while edible, seems to fall by the wayside and go largely unnoticed, unloved. Kaffir limes have an interestingly rough, squiggly, bumpy skin, the zest of which can be used. The ones I buy at the markets are usually the size of golf balls. They tend to have many seeds, and yield only a small quantity of rich, yellow juice. The taste is sharp, almost pungent and herbaceous, which may need some getting used to. Due to its distinctiveness, I prefer to use it lightly, and pair it with ingredients that take its edge off a little, while still showcasing its unique flavour. I sneakily added it to my jalapeno sour cream dip/spread a while back, and it works well there because it is but a squeeze of juice, buried within the spicy, tangy dip, just enough to impart a hint of exotic. 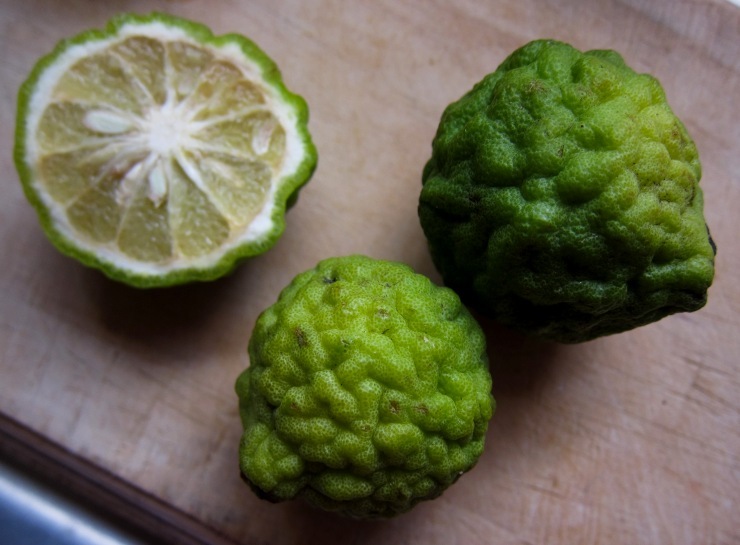 to me, kaffir limes look like little round puzzle balls, or mini green brains. In this easy recipe, however, kaffir limes are the star of the show, mellowed only with honey, water and ice. The honey softens the sharpness of the kaffir limes, and you can use as little or as much water and ice to dilute and cool as you see fit. Stir together kaffir lime juice, honey, and water until all is mixed/dissolved. Add a few ice cubes, stir again, and serve. P.S. Feel free to adjust the ingredient quantities to suit your taste buds! 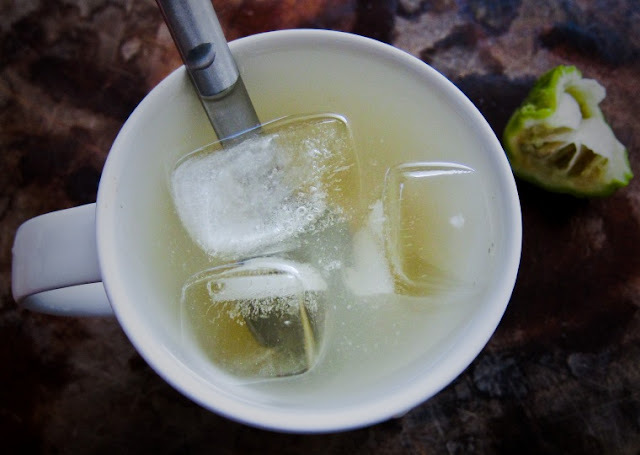 try this easy kaffir lime fruit recipe and make yourself some kaffir limeade! It grows mainly in Southeast Asian countries (and they are cultivated in Australia too), so that may be why you don't see them all the way over in Europe! Just today I was wondering about kaffir limes - this post came at the perfect time! Your description of them has cleared up a lot of confusion for me. I've never seen them available in my area, but I'll have to check into that and see if I can get my hands on some. Wonderful post! Ooh my friend has a tree and was wondering what to do with the limes..I think I will have to take a few off his hands! Looks perfectly refreshing. Aaaaaand now I'm really thirsty. Sounds fantastic! I've only ever used the leaves but will keep an eye out for the fruit. They do look like puzzle balls! 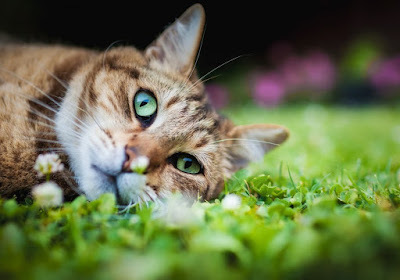 Oh, wonderful! I hate the fact that it's officially not summer anymore but because it looks like we'll be getting some beautiful weather in Melbourne this week, this drinks looks like the perfect beverage to enjoy after work! Oh awesome, and you're so right about the fruit being neglected. Looks delish! Shame its been basically winter weather since autumn started here in Sydney! Have you tried to add some ginger to it? I think it'll add a refreshing spice to it! I just looked the ginger-lime shandy recipe up! It sounds really tasty~ I just made some candied ginger and have a jar full of ginger syrup - I think I'll go make it! You always make the best sounding light and refreshing drinks! Love it! Farewell Summer :( It switched over very quickly here in Sydney. Howling winds, rain and storms. We had those one or two weeks ago, but now it's all fine and sunny again! Awesome! I have them growing in a pot on my front porch and am dying to pick the fruit and use it. Thank you for sharing such inspiring recipes. Looks so refreshing esp since it been so hot pheww! a keffir lime in Italy (we do get the leaves). And ordinary lime will still make a lovely limeade as I'm sure you'll know, but I guess it won't help if you're curious about the distinctive herbaceous quality of kaffir lime! I love normal limes and I love kaffir lime leaves, but have never tried kaffir limes. This looks like a perfect drink for this sweltering weather! I've never seen a kaffir lime out here but I love the lumpy bumpy look of them. I'll have to see if I can track some down! They are quite odd and interesting, aren't they? Hope you find some.